"Giambi" redirects here. For his brother, see Jeremy Giambi. Jason Gilbert Giambi (/dʒiˈɑːmbi/; born January 8, 1971) is an American former professional baseball first baseman and designated hitter. In his Major League Baseball (MLB) career, which began in 1995, he played for the Oakland Athletics, New York Yankees, Colorado Rockies and Cleveland Indians. Giambi was the American League MVP in 2000 while with the Athletics, and is a five-time All-Star who led the American League in walks four times, in on-base percentage three times, and in doubles and in slugging percentage once each, and won the Silver Slugger Award twice. He took performance-enhancing drugs during his career, for which use he publicly apologized. Giambi was named one of the Top 10 Most Superstitious Athletes by Men's Fitness. Giambi attended Sacred Heart Middle School in Pittsburgh. He then attended South Hills High School in his native West Covina, where he was a three-sport standout. Giambi was on the baseball team, whose roster also included his brother Jeremy and three other future Major Leaguers and teammates: infielder Shawn Wooten, pitchers Aaron Small and Cory Lidle. He batted .386 during his three years of varsity baseball, leading his team to the state finals as a senior. He was voted MVP in both baseball and basketball. In American football, he was an All-League quarterback. Giambi was selected in the 43rd round (1,118th overall) by the Milwaukee Brewers during the 1989 MLB draft. He did not sign and went on to attend college. Giambi attended Long Beach State University, where he played college baseball for the Long Beach State 49ers baseball team. Giambi played collegiate summer baseball for the Alaska Goldpanners, in the Alaska Baseball League. The Oakland Athletics selected Giambi in the second round of the 1992 Major League Baseball draft. He started his career that year with the short season single A Northwest League's Southern Oregon A's, where he hit .317 in 13 games. He was a member of the fourth place United States national baseball team at the 1992 Olympics in Barcelona. The Athletics invited Giambi to spring training in 1993. He then spent the 1993 season playing for the Modesto A's, the Oakland Athletics' single A farm team. Giambi also played for the Huntsville Stars in the Southern League. Giambi made his major league debut with the Athletics in 1995. Originally used occasionally as an outfielder, third baseman, and first baseman, Giambi assumed the full-time first base job upon the trade of Mark McGwire to the St. Louis Cardinals in 1997. Giambi led the team in 1998 with 27 home runs, 110 runs batted ins and a .295 batting average. In 1999, Giambi hit .315 with 33 homers, 105 walks (2nd in the league), and 123 RBIs (6th). He came in 8th in MLB Most Valuable Player Award voting. In the 2000 season he led the league in on-base percentage (.476; leading the majors) and walks (137; a personal high and still the most walks in the AL since 1991). He hit .333 (7th in the league) with 43 homers (2nd; a career high), 137 RBIs (4th; a career high), 108 runs (10th), and a .647 slugging percentage (3rd). Giambi narrowly won the American League Most Valuable Player Award over Frank Thomas. His 2001 season was nearly identical. He led the league for the second year in a row in both on-base percentage (.477; a career best, and still the highest OBP in the AL since 1995) and walks (129). He also led the league in slugging percentage (.660; a career best), doubles (47; a career high), times on base (320), and extra base hits (87). He batted .342 (2nd in the American League; a career high) with 38 homers (7th), 109 runs (6th), and 120 RBIs (8th). He was second in the league in intentional walks (24), the only time in his career that he was in the top 10 in this category. He finished a close second in MVP voting to Ichiro Suzuki, and won the Silver Slugger Award. Both years, he led the Athletics to the post-season, both times losing in the American League Division Series to the New York Yankees in five games. On December 13, 2001, Giambi signed a 7-year $120-million deal with the New York Yankees. In line with Yankee team rules, Giambi cut his long hair and shaved his goatee. The signing upset many Athletics fans, who felt betrayed by the departure of their team leader. Giambi became an object of the A's fans' wrath whenever New York visited Oakland. During a game on May 14, 2005, he was hit with a beer thrown by an unruly fan on his way back to the dugout. Giambi continued slugging with New York in 2002. He led the league for the 2nd consecutive year in times on base (300), had 109 walks (2nd), was 3rd in the league with both a .435 obp and 15 HBP, had 41 home runs (4th), 120 runs (4th; a career high), and a .598 slugging percentage (4th), knocked in 122 runs (5th), and batted .314 (6th). He came in 5th in AL MVP voting, and again won the Silver Slugger Award. He also hit an "ultimate grand slam"—a walk-off grand slam against the Twins in a rain-soaked extra-inning game, that won that game 13–12. Although his average dipped to .250 in 2003, he led the league in walks (129) for the 3rd time in his career and in HBP (21) and percent of plate appearances that were walks (19.4%), maintained an extremely high on-base percentage (.412; 3rd in the league), hit 41 home runs (4th), and had 107 RBIs (8th). He was also second in the major leagues in fly ball percentage (52.0%). He remained one of the most patient hitters in the majors. At the same time, he also led the league in strikeouts (140), the only season that he has even been in the top 10 in the league in that category. On July 30, 2004, test results confirmed that Giambi had a benign tumor, which placed him on the disabled list. He was treated for the tumor, and returned to the team and played in a game on September 14. That year, Giambi was voted in as the starting first baseman in the 2004 MLB All-Star Game despite finishing the year with a .208 batting average and just 12 home runs. Towards the middle of the 2005 season, Giambi saw a resurgence in his career. On July 31, he hit his 300th career home run off of Esteban Yan of the Los Angeles Angels of Anaheim. This was his 14th home run of the month, tying Mickey Mantle for the Yankee record for home runs in July. Giambi ended the 2005 season leading the major leagues in walk percentage (20.6%) and leading the American League in walks for the 4th time in his career (109), and in OBP for the 3rd time in his career (.440, as well as in fly ball percentage (47.7%); second in MLB to Todd Helton), and had an OPS of .975, placing him 5th in the AL. He hit 32 homers (10th in the league), the 7th time in his career in which he has hit 30 or more, and was 4th in HBP (19) and at-bats per home run (13.0). Giambi was named the AL Comeback Player of the Year. In 2006, Giambi was named the American League Player of the Month for April, hitting .344 with 9 home runs and driving in 27 runs. However, he was left off the 2006 American League All-Star roster. He finished the season leading the majors in walk percentage (19.8%) and leading the league in % Pitches Taken (64.4), 2nd in walks (110), hbp (16), and pitches seen per PA (4.37), 5th in at bats per home run (12.1), 6th in on-base percentage (.416), 7th in home runs (37) and slugging percentage (.558), 8th in intentional walks (12), and 9th in RBIs (113), despite playing in only 139 games (half of them at DH, and half at 1B) for the 2nd year in a row. He performed the unusual feat of having as many RBIs as hits, and for the 3rd time in his career had more walks than strikeouts. Giambi's numbers were down precipitously in the 2007 season due to an injury, in which he hit just .236 with 14 home runs and 39 RBIs. He played in just 83 games, 53 of which as a designated hitter. Giambi got off to a horrible start in the 2008 season, hitting below .200 for more than a month. However, by June he had turned his season around and become one of the team's most productive players. Giambi ended the season with a home run every 14.3 at-bats, beating out Alex Rodriguez to lead the team by a small margin. He was also one of only three players to hit a home run while pinch hitting in 2008, and the only one to do it twice. However, on November 4, 2008, the Yankees declined their option on Giambi for the 2009 season making him a free agent. On January 6, 2009, Giambi agreed to sign with the Oakland Athletics. He officially re-joined the A's the next day, and was given his old No. 16 jersey. Giambi hit his first home run since returning to the Athletics on April 25, 2009. On May 23, 2009, Giambi hit his 400th career home run in an 8–7 loss to the Arizona Diamondbacks. He was placed on the disabled list on July 20. At the time he had the lowest batting average in the majors, and 4th-lowest slugging percentage in the American League. On August 7, 2009, he was released by the A's. Looking for a veteran bat to help their playoff push, the Rockies agreed to a deal with Giambi on August 23, 2009. He was assigned to their AAA affiliate, the Colorado Springs Sky Sox. Giambi chose to wear the number 23 for his jersey's number. His first RBI with the Rockies came in the form of a bases loaded walk in his first plate appearance on September 1, 2009, after being promoted to the club upon roster expansion earlier that day. That year he had many clutch hits which kept the Rockies in contention for the National League Wild Card. He quickly became a fan favorite in Colorado. On January 23, 2010, Giambi reached an agreement to return to the Colorado Rockies. On September 12 Giambi hit a walk-off home run against the Arizona Diamondbacks, extending the winning streak for the Rockies to 10 games. The Colorado Rockies announced on January 17, 2011 a deal to put Giambi in the team's minor league organization with a spring training invite for the 2011 season. Giambi made the 2011 Opening Day roster out of spring training. The Cleveland Indians signed Giambi to a minor league contract on February 9, 2013. Giambi made the Indians major league roster following spring training. On July 29, 2013, Giambi became the oldest player to hit a walk-off home run. He broke his own record for oldest player to hit a walk-off home run in a season saving win for the Indians against the White Sox on September 24, 2013. Giambi was re-signed by the Indians on October 31, 2013 to a one-year minor league deal. The deal includes an invitation to Spring training. Giambi was hit by an Edwin Jackson pitch on March 7, 2014. This resulted in a broken rib, and Giambi missed the first 18 games of the season. He was activated on April 21. On August 2, 2014 Giambi gave up his 25 jersey number to Jim Thome to have it unofficially retired by the Indians, Giambi switched his jersey number to 72 that day. On the jersey that he gave to Thome, Giambi put down a message to Thome saying " Jim, It was an honor to be the last person to wear your uniform number in Cleveland Indians history! – Jason Giambi" It was kept a secret from the fans, the players, Thome himself and his family, happening after Thome signed the 1-day contract and threw out the 1st pitch. On February 16, 2015, Giambi announced his retirement. In December 2004, the San Francisco Chronicle reported it had seen Giambi's 2003 grand jury testimony in the BALCO investigation. The newspaper said that in his testimony, Giambi admitted to using several different steroids during the off-seasons from 2001 to 2003, and injecting himself with human growth hormone during the 2003 season. In a press conference prior to the 2005 season, Giambi apologized publicly to the media and his fans, though he did not specifically state what for. The lawyer who illegally leaked the testimony later pleaded guilty, and was sentenced to 2 and a half years in prison. Giambi apologized again on May 16, 2007, this time specifically for using steroids, and urged others in the sport to do the same. "I was wrong for using that stuff", he told USA Today. "What we should have done a long time ago was stand up—players, ownership, everybody—and said, 'We made a mistake.'" When asked why he used steroids, Giambi responded: "Maybe one day I'll talk about it, but not now." Giambi did speak with George J. Mitchell, after being forced to do so by Bud Selig. Subsequently, in December 2007, the Mitchell Report included Giambi along with his brother Jeremy Giambi, who also admitted to using steroids during his career. The prosecution in the Barry Bonds perjury case indicated they intended to call both Jason and Jeremy Giambi to testify against Bonds in his March 2009 trial. Giambi married Kristian on February 2, 2002. His wife is the designer and owner of a lingerie and loungewear company called Brulee. Giambi is one of the owners of Casa Cielo (also owned by Scott Deskins of SCC Development in Austin, Texas) in Cabo San Lucas, Mexico. It is an 18,000-square-foot (1,700 m2) home on top of the Pedregal sign. He has a brother, former major-leaguer Jeremy Giambi, and a sister named Julie. He makes his home in Henderson, Nevada. Giambi has appeared as the featured athlete on the cover of several video games throughout his career. Giambi has also been featured as a playable character in Backyard Baseball 2001 as well as Backyard Baseball 2003. ↑ Thompson, Teri (May 18, 2007). "Giambi admits he took steroids". Daily News. New York. ↑ Murphy, Ryan. "Top 10 Most Superstitious Athletes". Mensfitness.com. Retrieved September 14, 2011. ↑ "February baseball triggers memories of Jason Giambi's first spring training, which he spent in silence". cleveland.com. Retrieved February 16, 2015. ↑ Curry, Jack (December 14, 2001). "Tearful Giambi Is Proud To Put On the Pinstripes". New York Times. p. S1. ↑ King, John (May 16, 2005). "Fan who threw beer at Giambi was jailed". San Francisco Chronicle. ↑ "Major League Leaderboards » 2003 » Batters » Advanced Statistics | FanGraphs Baseball". Fangraphs.com. Retrieved September 14, 2011. ↑ "Major League Leaderboards » 2003 » Batters » Batted Ball Statistics | FanGraphs Baseball". Fangraphs.com. Retrieved September 14, 2011. ↑ "Giambi hits two homers, reaches 300 for career". Associated Press. July 31, 2005. Retrieved October 9, 2006. ↑ "Major League Leaderboards » 2005 » Batters » Advanced Statistics | FanGraphs Baseball". Fangraphs.com. Retrieved September 14, 2011. ↑ "Major League Leaderboards » 2005 » Batters » Batted Ball Statistics | FanGraphs Baseball". Fangraphs.com. Retrieved September 14, 2011. ↑ "Major League Leaderboards » 2006 » Batters » Advanced Statistics | FanGraphs Baseball". Fangraphs.com. Retrieved September 14, 2011. ↑ King, George A. (September 4, 2008). "Jason Giambi Loses Bout With Bathroom Door". New York Post. Retrieved September 14, 2011. ↑ "A's re-acquire slugger". Msn.foxsports.com. January 6, 2009. Retrieved September 14, 2011. ↑ "Giambi rejoins Oakland, gets $5.25 million deal". Sports.yahoo.com. April 20, 2011. Retrieved September 14, 2011. ↑ Sporting, The (August 7, 2009). "The drumbeat:Giambi Released". SFGate. Retrieved September 14, 2011. ↑ "Jason Giambi reportedly agrees to deal with Colorado Rockies". ESPN. August 23, 2009. Retrieved September 14, 2011. ↑ Stephens, Bob (September 1, 2009). "Giambi, Skid Done In The Springs". The Gazette. ↑ Harding, Thomas (January 17, 2011). "Rockies bring back Giambi with Minors deal". MLB.com. Retrieved January 17, 2011. ↑ "Giambi, 40 and Scuffling, Hits 3 Homers Against the Phillies". New York Times. May 19, 2011. Retrieved May 19, 2011. ↑ "Giambi, Rockies Manager". New York Daily News. ↑ Bastian, Jordan (February 9, 2013). "Tribe signs veteran slugger Giambi to Minors deal". MLB.com. Retrieved February 10, 2013. ↑ "Scott Kazmir named Indians' fifth starter, Jason Giambi makes the team". Retrieved May 13, 2013. ↑ "Chicago White Sox vs. Cleveland Indians – Recap – July 29, 2013 – ESPN Chicago". ESPN.com. Retrieved February 16, 2015. ↑ "Roll Tribe! Jason Giambi's walk-off homer sends Cleveland Indians fans into joyful frenzy on social media". cleveland.com. Retrieved February 16, 2015. ↑ Nowak, Joey (March 13, 2014). "Giambi has broken rib, likely to miss opener". MLB.con. Retrieved March 13, 2014. ↑ Adams, Steve (February 16, 2015). "Jason Giambi Retires". mlbtraderumors.com. Retrieved February 16, 2015. ↑ "Admissions before BALCO grand jury detailed". ESPN. December 2, 2004. Retrieved October 9, 2006. ↑ Fainaru-Wada, Mark; Williams, Lance (December 2, 2004). "Giambi admitted taking steroids". San Francisco Chronicle. Retrieved May 25, 2007. ↑ "ESPN – BALCO leaker Ellerman gets 2½ years in prison – MLB". ESPN. July 12, 2007. Retrieved September 14, 2011. 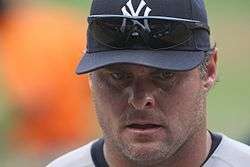 ↑ "Giambi says MLB should own up to presence of drugs". ESPN. Retrieved May 18, 2007. ↑ "Report: Jeremy Giambi admits he used steroids". USA Today. March 13, 2005. Retrieved May 25, 2007. Wikimedia Commons has media related to Jason Giambi.